The rivalry between Ebonheart and Mournhold dates back nearly to the dawn of history. At one time, the two city-states had been one, ruled over by Clan R'Aathim, whose royal house held the High Kingship of Morrowind. Ebonheart later split into two separate city states, Ebonheart and Mournhold. The Royal city of Old Mournhold was destroyed at the end of the First Era by the Daedric Prince Mehrunes Dagon. Almalexia and Sotha Sil came too late to prevent this destruction, but they managed to banish Mehrunes Dagon back to Oblivion. 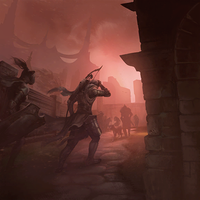 During the Three Banners War, Mournhold served as the capital of the Ebonheart Pact, an alliance of the three races of eastern Tamriel—Nords, Dunmer, and Argonians—following their joint victory in expelling the Second Akaviri Invasion. The Great Moot of the Pact convened in the city, and was presided over by Jorunn the Skald-King, High King of Eastern Skyrim. In 2E 582, the city was infiltrated by the Maulborn, a secretive Daedric cult posing as a charity organization. Because of this, the city was on high alert and no one could enter without being registered. Part of the Maulborn force managed to enter the Tribunal Temple through the sewers and opened portals to Oblivion inside. They were eventually defeated by the Soulless One, who worked with Almalexia to eradicate the Maulborn threat. However, the cult was able to steal the artifact The Judgment of Saint Veloth from the temple. During the Tiber Wars, the city was sacked by the Imperial legions, and was subsequently placed under military rule for a dozen years. 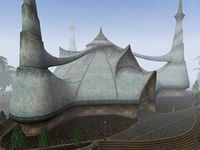 Following its conquest by Tiber Septim and General Symmachus, it was gradually returned to civilian government and Queen Barenziah later ruled the Imperial Province of Morrowind from here. In response to Tiber Septim's rising greatness, Almalexia commissioned an expansion and rebuilding effort in Mournhold. As a whole, the city then became known as Almalexia in her honor. [UOL 1] The historic center of the city, containing the Tribunal Temple compound, retained the name of Mournhold. During the Arnesian War, the city came under attack in the ensuing revolt and General Symmachus was slain. Barenziah fled and abdicated her throne to her uncle, King Llethan. Llethan eventually died (amid rumors of being poisoned), and Helseth took the throne. The Royal Palace of King Helseth formed the center of the inner city and was home to the king, his mother Barenziah and a Royal Guard garrison, as well as Imperial Cult services. The Temple to the north housed the High Chapel, home to Almalexia. The chapel also included the offices of the Archcanon, an infirmary, and the personal guard of the goddess, the Hands of Almalexia. 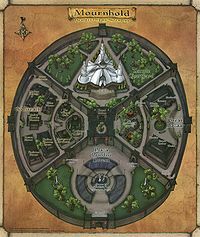 The city had five primary sections: Godsreach, the Great Bazaar, Plaza Brindisi Dorom, Royal Palace, and the Temple Courtyard. The ruins of Old Mournhold, upon which the city of Almalexia was built, were accessible through the city's sewer system. In the late Third Era, Mournhold suffered a series of cataclysms. Fabricants, creatures created by the reclusive god Sotha Sil, suddenly appeared in the city in 3E 427 and began attacking all who lived there. The Dwemer ruin Bamz-Amschend was suddenly revealed in the attack, and subsequently became accessible though Plaza Brindisi Dorom. The creatures were defeated, but then the living god Almalexia disappeared amid rumors that she had gone mad, murdered Sotha Sil, and unleashed his creatures on the city, finally being slain by the Nerevarine. 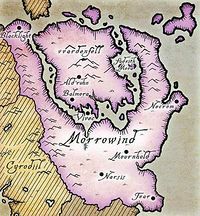 Following the aftermath of the Red Year in 4E 5, Mournhold was the center of relief efforts to Vvardenfell led by House Redoran. Around a year later, the city was sacked by the invading Argonians of Black Marsh and Morrowind's capital was moved to Blacklight. 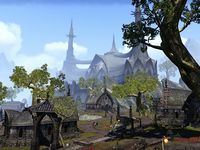 Mournhold was still being rebuilt in 4E 201, a shadow of its former self. Mournhold Temple was renovated and the last traces of Almalexia were removed. Plaza Brindisi Dorom now houses a large building used by House Indoril to accommodate the new priests and pilgrims who come to pay their respects at the New Temple. This page was last modified on 24 February 2019, at 15:04.